If you’re in the initial planning stages for a dental implant, you may already be encountering a number of options to consider. One that may come up is how the visible crown will attach to the metal implant imbedded in the bone. Generally speaking, implants are composed of two parts: a metal post most often made of titanium placed into the bone that serves as the “root” for the new tooth; and a visible, life-like crown made of dental porcelain that attaches to an abutment on the titanium post. The crown can be attached in one of two ways: either with a small screw through the biting surface of the crown into a receiving hole in the abutment or cemented to it. 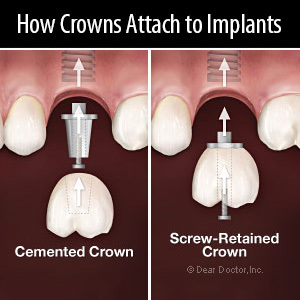 The major advantage of a screwed crown is that it allows for easy removal of the crown if needed. While the titanium post can often last a lifetime, porcelain crowns more often need repair or replacement since they receive the brunt of the biting forces in the mouth. A screw-attached crown is much easier to remove than a cemented one. On the other hand, screwed crowns have a small access hole that must be restored with a tooth-colored filling to help the crown appear natural. This isn’t too great an issue with back teeth but does make achieving a natural appearance in the front more difficult. Cemented crowns look more like a natural tooth and are thus more flexible in achieving the desired appearance. Besides the possibility the cement may cause gum inflammation or bone loss, the chief detraction from cemented crowns is the difficulty in removing them. Crowns are often damaged in this process so it’s highly likely it will have to be replaced rather than repaired. It’s possible to use weaker cement, but this raises the risk of the crown coming loose at some point from the abutment. As we plan for your implant, we’ll discuss which type of attachment will work best for you, depending on the tooth to be replaced and other conditions with your oral health. The end result, though, should be the same — a new, natural-looking tooth that serves you well for many years to come.